As we careen toward Thanksgiving I’ve been trying with all my might to enjoy November and its relative calm. After the Big Meal it will be all Christmas and crazy, but for now it’s still fall, everything pumpkin is still in vogue for the month. There are still a few patches of color here and there where the rain and wind have not knocked them off the trees, and it’s still not bitter cold. Although, truth be told, the weather here has been so bizarre I think I’d take the bitter cold just so I’d know how to cope. Instead we’ve had a day where it flurried like mad for about an hour followed by temperatures in the 70’s a few days later. You never know if you’ll need the A/C or the heat on. It’s the ending of fall, and it’s bittersweet. We will be having Thanksgiving at home this year with Paul’s family, and I am enjoying getting the house organized and cleaned in readiness for it (hey, cleaning is therapeutic for me!). In the meantime it’s starting to get hard to concentrate on school when there’s so much to be done and to enjoy, but we’re at least not falling behind. 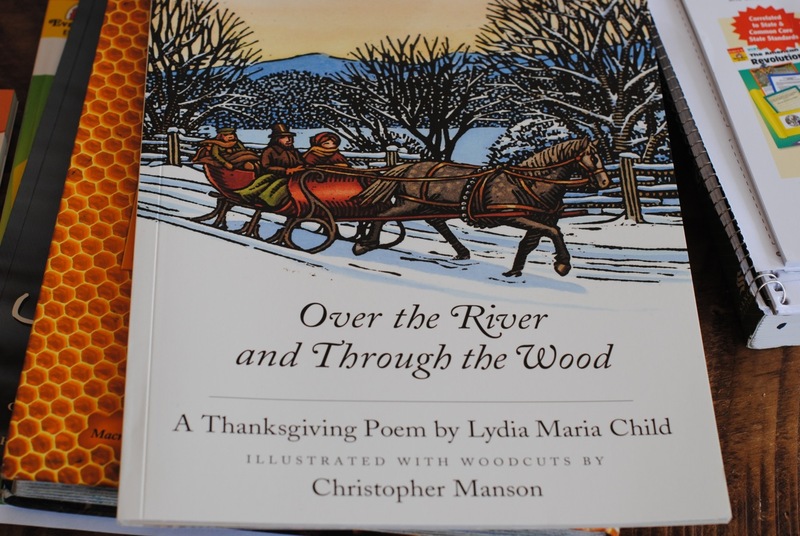 Oona’s reading a lot of seasonally appropriate books about Thanksgiving (though the pickings are slim on these – as a historian I don’t like the ones that whitewash the history, even-or maybe especially- for little ones). 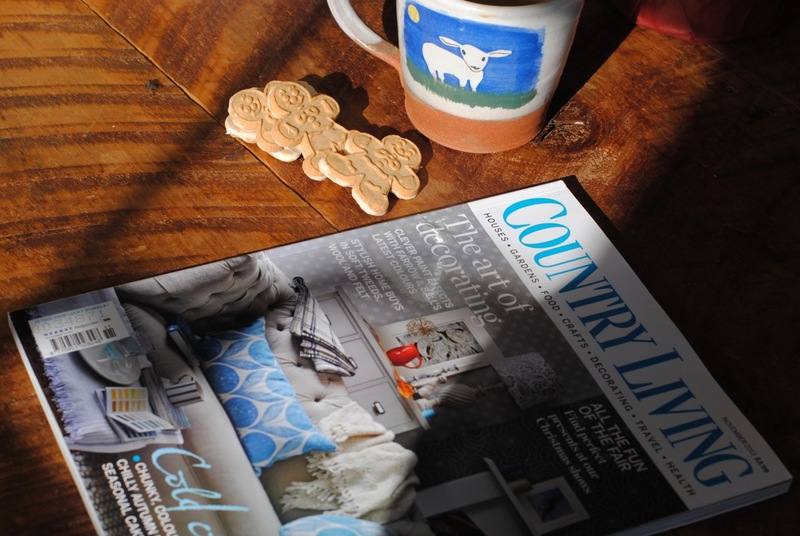 Yesterday my November issue of British Country Living came, and I spent a glorious afternoon with a cup of coffee and some gingerbread cookies from Trader Joe’s, pouring over its pages. That mug, by the way, is one of my absolute favorites. It was made by my friend Anna Branner with Susan’s logo on it, and you can find more of Anna’s wonderful wares HERE. 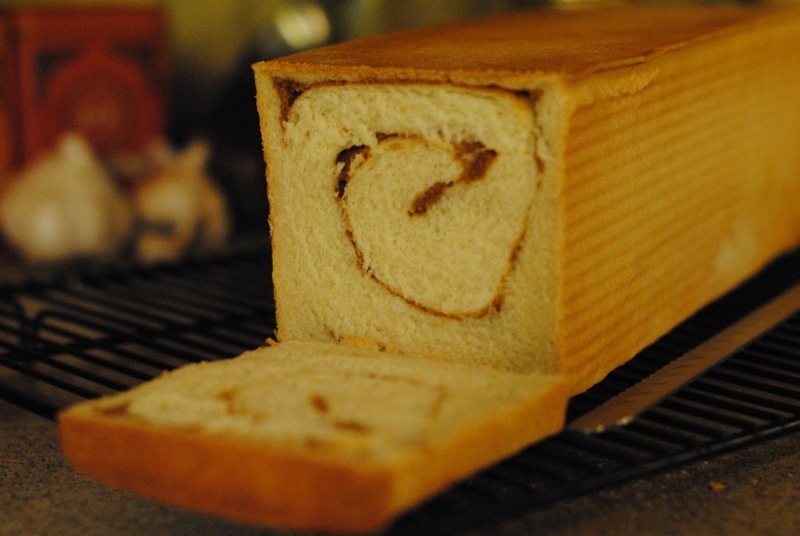 To top off all things Novembery, we’ve been enjoying some homemade Pumpkin-Cinnamon Swirl bread. It’s wonderful toasted with a bit of butter. I used the recipe for the Cinnamon Swirl bread (made in the Pullman Loaf pan) from King Arthur Flour, but for the filling I added about a third cup of pumpkin puree and took out 1 egg and the water. It’s got just a touch of pumpkin-y flavor when it’s done and it smells heavenly while it’s baking! This entry was posted in Uncategorized and tagged food, Homeschooling, Seasons. Bookmark the permalink. Thanks for the shout out Amy. 😉 And I only have 3 or 4 of those mugs left.